Welcome to the Tuscaloosa Rotary Club! During the calendar year 2017, the Rotary Club of Tuscaloosa has been proudly celebrating its 100th anniversary! Rotary is a local service club, bringing together a community of civic-minded citizens for fellowship and service. Membership is by vocational classification, with the expectation that Rotarians represent their business or profession in Rotary, and in turn represent Rotary and its principles among their colleagues. Regular attendance at weekly meetings is expected. As successful business and professional people who are in command of their own schedules, Rotarians are expected to make their presence at Tuesday meetings a priority. The Rotary Constitution requires 60 percent minimum attendance with no more than four consecutive unexcused absences. Missed meetings can be made up by attending an online e-club, another Rotary Club, or a designated Rotary activity or committee, within two weeks before or after the absence. 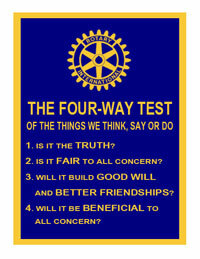 Rotary is a member-supported organization. The initiation fee is $120 (for former Rotarians $30). This is for pro-rated dues to RI and District, publications, etc. Quarterly dues of $210 (payable in advance during the first month of each quarter), include the weekly meals. New members pay the initiation fee with membership application. Pro-rated dues for the current quarter are billed later by the club treasurer. World Understanding. Rotarians gain an understanding of humanitarian issues and have a significant impact through international service projects and exchange programs. Entertainment. Rotary events provide a diversion from personal and business routines, including fellowship, information, education, and service opportunities. TRMF was created by the Rotary Club of Tuscaloosa in 1971, as a separate legal entity to provide for tax-deductible contributions for local service. From its first project in 1972-73 to the present, Rotary has raised and contributed more than $900,000. In one way or another, virtually every citizen of Tuscaloosa county has been touched by the service projects of Rotary. Examples of Rotary Community Service are visible in club support of Boy-and-Girl Scouts, the DCH Open-Heart Surgery Suite, FOCUS on Senior Citizens, the Tuscaloosa County Library, Strings in Schools, the Childrenʼs Hands-on Museum, Bama Theatre, Salvation Army, and other social service projects.